Those are all bigger guys - lightweights or heavier. LOS ANGELES - Saturday's reboot of a bantamweight title fight between TJ Dillashaw and Cody Garbrandt played out similar to the first meeting from eight months ago - although this time, it took Dillashaw only one round to get it done. "America is all about winners and the victor of this next bout, I want to fight that guy. I'm going up and I want that belt too". Now, not only did Cejudo stake his claim as the best flyweight in the world, he made his plea immediately after the fight to become a two-division champion by facing the victor of Saturday's bantamweight title main event between TJ Dillashaw and Cody Garbrandt. The referee called it at 2:41 via TKO (punches). Loser's prize: If it's Dillashaw then a rubber match with Garbrandt could be on the cards right away but if not, I would imagine either Jimmie Rivera or Dominick Cruz would be pegged for a top-contender fight. His victories over Raphael Assuncao and in particular John Lineker were outstanding and after earning a brutal KO win over his great rival Garbrandt, I think it's safe to say that TJ is fighting at his very peak right now. Both fighters are terrific strikers so this should be a fight with both standing up almost the entirety. Johnson is a sizable -500 favorite with Cejudo at +350. Above is live video of the event's post-fight press conference which kicks off approximately 30 minutes after the main event between Dillashaw and Garbrandt comes to a close (courtesy of the UFC). I want to fight the victor at 135 pounds and I deserve it. Demetrious Johnson didn't go up and they don't have to come down. Johnson broke Anderson's Silva's all-division record of 10 straight successful title defenses with No. 11 in October via submission over Ray Borg. 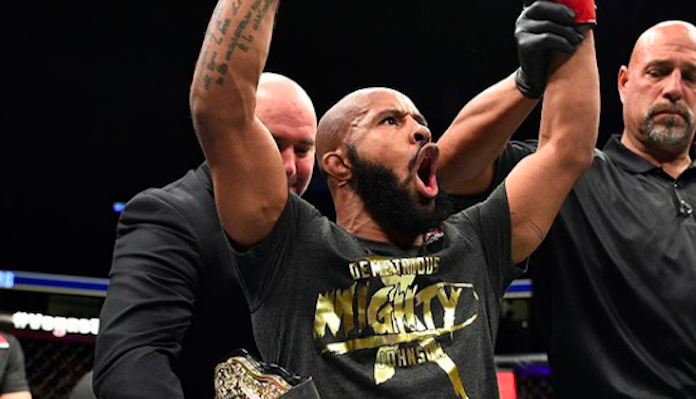 In the opening round, Johnson was having his way and the fight briefly looked like their first bout in 2016 when Johnson dominated Cejudo at UFC 197. Despite the razor-thin loss, Johnson remained in good spirits after the fight and showed a ton of class by not disputing the decision in any form.